Mount Pleasant Granary - Thursday 5th. March, 2015 --- It wasn’t to be! I took this snap out of the kitchen window of the Manse at Cranshaws -- what a lovely view from a kitchen window! Well, it wasn’t to be. Bangladesh actually won quite comfortably with eleven balls to spare and plenty of wickets in hand – but Kyle Coezer was ‘man of the match’, something I expect that he will remember for years to come. I walked Mix and then at ten I set off with Stephen to attend a meeting in Hawick with representatives of our two partner Border presbyteries to plan the visit of the Moderator of the General Assembly at the end of this month. I say ‘to plan’, of course, our planning was done a while ago and our programme was submitted to Edinburgh more than a month ago; today was a day of co-ordinating the Moderator’s activities within the three presbyteries. We enjoyed a sandwich lunch with our colleagues and then drove home. For some reason today went quite slowly I suppose because I was surprised how soon we got back from Hawick. So I did some work in the Bothy and went for a walk with Mix. 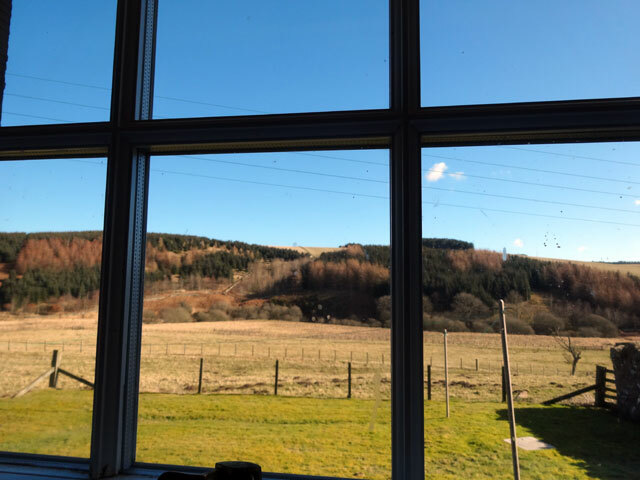 We all dined together in the farmhouse – I hadn’t been there for a couple of days – and then I came across to the Bothy to prepare the music for Arrochar for the World Day of Prayer. That done I joined Olive, Mum and Rachel to see the first episode of Banished – a seven-part series set in Australia in the time of the convicts arriving at Botany Bay in 1778. It was well done but I haven’t quite made up my mind about it yet.